Our Wolverine Publications room is a cozy workspace for my 7th/8th graders to come together to plan our newspaper. This is our first year having a class like this, and I gave the provided room a complete make-over before school started in September. The walls are gray and all the furniture is white. There is a counter where the chrome books are located and the white tables are clustered in the middle of the room. 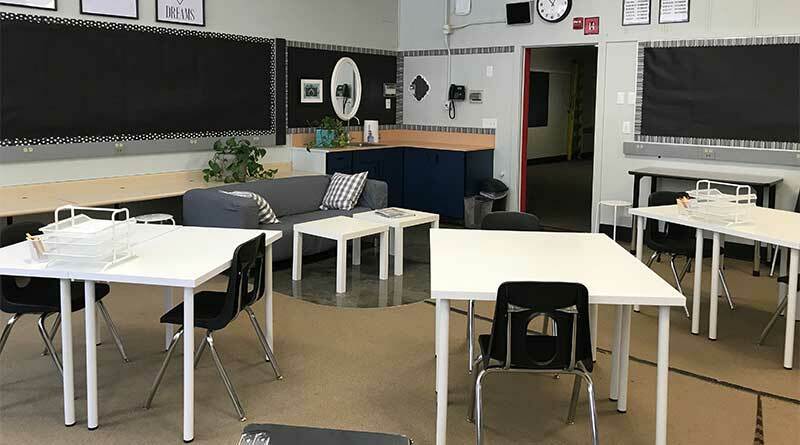 A comfy couch, coffee tables and a coffee/tea/snack station provide a real-feel experience for my middle school students. The layout of the room allows for whole group collaboration. We meet at the beginning of each period together in the room to go over the agenda and deadlines. Then the kids move throughout the school with their press passes to do most of their work. The students feel that our Publications Room is a real work space – not just a classroom. They have set up a coffee/tea and snack station, bring their lunches, and feel as though they are at a real job. This is our first year having a Publications class. We use Pictavo for yearbook and Google Slides for the newspaper. We have five Chromebooks and access to one of the schools computer labs. Our main camera is a Nikon D5600. We also use an old Canon SLR and five Canon Powershots. The only equipment we have is computers and cameras. I paid for all furniture/decor in our workspace out of my own pocket. IKEA is my friend. The school paid for the cameras and Chromebooks. After I worked for three weeks creating our Publications room and using my own money to furnish and decorate it my school district said they would put in new carpeting over Christmas vacation (it is a very small space). When the time came to do it I was told there was no money. New carpet would be at the top of our wish list. We also need more Chromebooks because the computer lab is not always available for us to use.